This item is shipped to Area 1(sent by EMS). 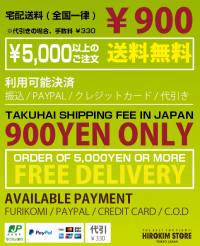 ※Our order system for credit card is Japanese language. ※Arrival date is different depending on country. ※Some areas can not be delivered by EMS, so please check in advance. ※As for customs duties etc., it follows a rule of recipient country, please check in advance. ※Order with exact address and name.We will not confirm arrival after shipment. We are not responsible for your mistake.